This NewAir Portable Ice Maker is capable of making up to 50 pounds of ice per day! It's summertime and nothing is better than having lots of ice on hand for parties, outdoor cookouts, picnics and all of your warm summertime activities. We have an affordable ice maker solution for you! Produce fresh ice whenever and wherever you need it with our newest product. NewAir User Friendly, Portable Ice Maker AI-100R will make ice in 13 minutes! This Model AI-215SS also has an 18 Hour Timer. No more waiting for your refrigerator to make ice for you. You can choose from three ice cube sizes, small, medium and large. Never buy ice again! No more trips to the convenience store because you ran out of ice! The NewAir Portable Ice Maker also looks great on a kitchen countertop and comes in 3 great bright colors in addition to silver and black. 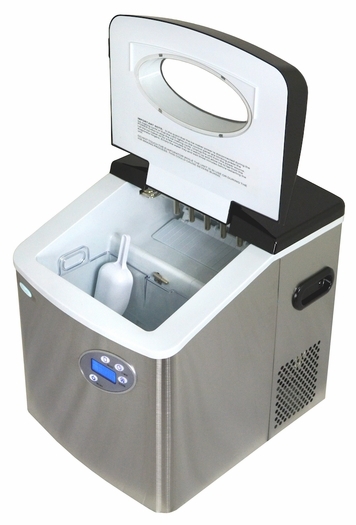 Need an ice maker in your game room, kitchen or mini bar? Just plug it in, fill the tank and start making ice today!